Israelis are neither blind to Netanyahu’s flaws nor fooled by his diversions. They chose him because he best reflects their political values and best secures their interests. 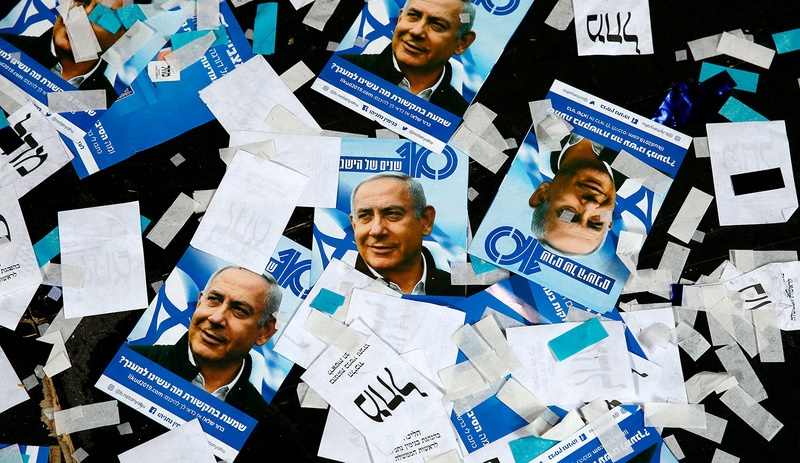 Posters of Benjamin Netanyahu on the floor of Likud party headquarters on election night 2019. JACK GUEZ/AFP/Getty Images. I am an avid reader of Haviv Rettig Gur, and his latest essay in Mosaic, “How and Why Israelis Vote,” is a timely reminder of what makes him so good. In explaining Israel’s April 9 elections a week before they took place, he laid out the key elements clearly and thoroughly while providing balanced, trenchant, and thought-provoking analysis. In responding, I want to offer three observations that build on what he wrote and that focus attention on Israel’s voting public, whose common sense and sound judgment have been obscured by the media’s incessant focus on what made this year’s campaign the ugliest since the 1981 elections. In buttressing my claims, I will make use of findings in the 70 surveys commissioned by the country’s leading news outlets during the course of the campaign (available in Hebrew here), three polls carried out by the Israel Democracy Institute (IDI, accessible in Hebrew here), and of course the final results themselves. First, despite oft-repeated claims that voters were successfully manipulated by Prime Minister Benjamin Netanyahu’s tactics of demonizing his opponents, or were seduced by the intervention of foreign leaders bearing gifts, the four-million-plus Israelis who voted were hardly swayed by either of those things. To the contrary, they demonstrated the stability of their commitments by remaining loyal to the ideological blocs with which they identified prior to the campaign. Even President Trump’s decision to recognize Israeli sovereignty in the Golan, and Vladimir Putin’s arranging the return from Syria of the remains of Zachary Baumel, an Israeli soldier long missing in action, caused but a momentary upward blip for the prime minister and the Likud party he heads. To appreciate the stability of voters’ preferences, a good point of departure is an IDI survey in late January 2019, before the lists of parties and candidates had been finalized. Israelis (Jewish and Arab alike) were asked to place themselves along an ideological scale in which the numeral 1 signified a position on the left, 4 in the center, and 7 on the right. Among respondents who expressed an opinion, 14 percent self-identified as left (numeral 1 or 2), 8 percent as center left (3), 20 percent as center (4), and 17 percent as center right (5). The largest grouping of all, 41 percent, declared themselves on the right (6 or 7). IDI repeated this poll in late February, after a month of intense campaigning and on the eve of the announcement by the state’s attorney general of his decision to consider indicting the prime minister for three separate cases of graft. The figures were virtually unchanged. Most importantly, the ideological commitments expressed in these surveys proved an excellent predictor of the election outcome. Meretz and Labor, the two leading lists associated with the Israeli left, together with the two main Arab parties (whose views on key issues place them, in the context of Israeli politics, on the left), won 20 seats in the 120-seat Knesset, or 17 percent, not far off from the 14 percent of the electorate that identifies with the left. On the right, a half-dozen parties, including Likud and its center-right ally Kulanu, took a total of 65 seats, or 54 percent of the places available in the Knesset. This corresponds to the 41 percent self-identifying on the right and the 17 percent in the center right, a total of 58 percent. The 4-percent gap between the expected number of seats and the actual results is accounted for largely by the fact that two right-wing parties, the New Right and Zehut, garnered between them more than a quarter of a million votes but earned no seats since neither one crossed the electoral threshold of 3.25 percent. To put this more simply: the Israeli electorate leans strongly to the right, and with the vast majority of Israelis voting for parties that reflected their ideological preferences, it is hardly surprising that Likud and its natural allies gained 65 seats, while their opponents won a total of 55. This doesn’t suggest the campaign was meaningless. Voters did shift their preferences in the weeks leading to election day, but they did so within the bloc to which they belonged, thus affecting the relative size of individual parties but not the main outcome of the election. For the majority of undecided voters who told pollsters they were deliberating between two parties, those parties were within a single ideological grouping (such as the left) or in immediately adjoining blocs, such as the left and the center left; only in rare cases was the choice across the main party fault line—that is, between a party like Blue and White, in the center, and one like Likud, on the center right. Indeed, a survey three weeks before election day found only 3 percent of voters torn between these two large parties. From this perspective, the main story of the elections was that Blue and White captured virtually all of the votes in the center left, thus growing at the expense of Labor and Meretz, while Likud captured votes from strongly right-wing voters, keeping all of its partners small. Most significantly, Blue and White won over very few center-right voters, who are the swing factor in Israel; thus, the right-wing bloc led by Netanyahu prevailed over a competitor made up of the left and center. The perception that this campaign was about personalities rather than issues led many observers to blame this development on Netanyahu, on Gantz, or on Israel’s political elite more generally, and/or to decry the public for lacking interest in substance. But a close reading of the situation suggests a more nuanced phenomenon and indeed a generally positive one. Throughout the campaign, the main contest was between Netanyahu’s Likud and Gantz’s Blue and White, two parties whose supporters were largely clustered around the center and center right and who between them ended up winning nearly 60 percent of the Knesset seats. And little wonder: the leaders and supporters of both parties favor continuing the policies pursued by a succession of Netanyahu-led governments over the past ten years, policies seen by the Israeli mainstream as largely successful. Among those policies, the foremost involves relentless action to prevent Iran from obtaining nuclear weapons or establishing a stronghold in Syria. Both parties also believe Israel should retain the Golan Heights permanently. Both agree that, at present, Israel lacks a Palestinian partner for peace; that it should avoid fruitless bilateral negotiations or unilateral withdrawals; and that in any future scenario it should retain a united Jerusalem, settlement blocs, and a defensive border in the Jordan Valley. At the same time (and notwithstanding an eleventh-hour nod in a different direction by Netanyahu), neither party has favored annexation of parts of the West Bank. They also concur on the broad strokes of a growth-oriented, market-based economic policy that has proved consistently successful. These views in turn reflect the mainstream consensus in Israel. The formation of that consensus, moreover, is the sign of a mature, sensible citizenry that, despite living in a country known for ideological polarization, has embraced the lessons taught by experience and reality, and has come together behind a common point of view. Given this widely shared agreement on the most essential policy questions, it follows that the two largest parties had little reason to argue over the issues. Rather, they competed over who was best qualified to implement the agreed-upon policies. Hence, the nightly television ads of Likud and of Blue and White were devoid of ideological clash or bold positions, and even the latter’s 45-page platform was filled largely with platitudes. This actually bodes well. Countries are often governed best when the leading contenders for power compete for swing votes in the center and the victorious side is able to rally a larger swath of the electorate to embrace its policies and actions. Instead of decrying the absence of clash, observers would have been wiser to recognize the signs of a healthy political system that, rather than creating a monopoly on power for one party, had given rise to two viable competitors, each of which sought the voters’ support on the basis of an ideology both hold in common. A caveat, however: this is also not the full picture. Just under 20 percent of the electorate, represented mainly by four parties that won Knesset seats, is to the left of Israel’s centrist Likud/Blue-and-White bloc, and nearly a quarter of the electorate, represented principally by six parties (four of which won seats), is to the right of it. To a large degree, these ten smaller parties ran their campaigns based on policy disagreements with the centrist parties and with one another. As Gur notes, they focused on “contending views of Israel’s religious, educational, cultural, and economic policies,” but some also differed with the centrist bloc on security and peace—with the dovish Meretz calling for the creation of a Palestinian state in the West Bank and Gaza based on the 1967 borders and the New Right demanding annexation of the 70 percent of the West Bank that contains most of the Jewish residents and relatively few Palestinians. But this, too, is the sign of a healthy democracy, with parties dissenting from the status quo able to ensure that key issues are kept in the public eye and positioning themselves to champion their views in the next parliament. This brings us to the third issue: given that the Israeli mainstream was not divided on issues, what question did lie at the core of the April 9 election? Many leading commentators, including Gur, correctly called it a referendum on Benjamin Netanyahu after a decade of his tenure as prime minister. I think this point can usefully be sharpened by reference to two premises that Israelis widely hold to be true even though they are in tension with each other, or at least seem to pull in opposite directions. On the one hand, Netanyahu has been remarkably successful in foreign and defense policy under incredibly challenging circumstances. He has done this by demonstrating the wisdom to determine the right policy for Israel, the courage to remain true to that policy despite massive counterpressure from foreign powers with opposing ideologies and interests, and the diplomatic and political skill to work within the regional, international, and national arenas to achieve the best possible outcome given the cards he held. In the course of the last decade, demonstrating similar abilities, he has likewise presided over a period of Israeli growth and prosperity that has largely avoided the pitfalls experienced by the world’s leading economic powers. And yet, on the other hand, it is also widely agreed—including by many people I know well who have worked with and in many cases still support Netanyahu—that he has a host of character flaws and that in recent years these flaws have become increasingly and alarmingly pronounced. Without enumerating them, suffice to say in a nutshell that he is not the kind of person most Israelis would want as a colleague, a neighbor, a friend, or a role model. The question Israeli voters faced was thus how to balance their views concerning Netanyahu’s proven abundance of political virtues with their views concerning his manifest deficit of personal virtues. As the Israeli strategic expert Dan Schueftan has pointed out, it would be wonderful if all good things came together in the same person, hence producing no quandary. This, however, happens only rarely. In the last century of the American presidency, for example, I would posit that only two figures, Harry Truman and Ronald Reagan, simultaneously exemplified both kinds of virtue. By contrast, Israel’s greatest prime minister, David Ben-Gurion, possessed the political virtues to a degree rare among leaders anywhere but in his personal character is widely understood, even by his admirers, to have been power-hungry, a habitual liar, and in human interactions petty and vindictive. Since, however, without him there almost certainly would not be a Jewish state today, voters and colleagues alike chose wisely in regularly giving him the highest positions in the Zionist movement and then in the state of Israel during the quarter-century beginning in the mid-1930s. Likewise, Israelis who in this election supported Netanyahu by backing Likud or one of its allies generally understood his personal flaws, made their peace with them, and were unmoved by continued manifestations of them. In late February and early March, many pundits were confident that the attorney general’s announcement of his intent to indict Netanyahu, an announcement accompanied by large amounts of damning evidence, would undermine the latter’s support. But polls showed only a momentary dip, after which Likud’s position actually improved. In late March, a Channel 12 survey asked whether, in a fourth scandal, the “Submarine Affair,” Netanyahu’s actions had been motivated by legitimate national concerns or by personal interests. Sixty-one percent of respondents, including a significant percentage of those with right-wing views, chose the latter—but once again, support for Netanyahu and Likud did not diminish. Though few pre-election polls probed the rationales behind the preferences of prospective voters, the last two surveys run for the newspaper Yediot Aḥaronot got at the subject indirectly. In a survey published on March 28, when asked which candidate, Netanyahu or Gantz, was “better suited to be prime minister” (emphasis added), Netanyahu garnered an eleven-point lead over Gantz. But when the same respondents were asked which of the two “would you like to see as prime minister after the upcoming elections” (emphasis added), Netanyahu’s lead narrowed to five points. The following week, just before the election, pollsters for Yediot asked the same questions. Netanyahu was judged better suited to be prime minister by a margin of nine points, but was preferred for that post by a margin of only one point. One can explain these divergences in various ways; my own guess is that these particular swing voters had difficulty stomaching Netanyahu’s lack of personal virtue. We don’t know how this conflicted four percent of the electorate ended up resolving their dilemma between the candidate they found more suitable and the one whom they wanted to see win, but those opting for Gantz were insufficient to swing the election to a coalition led by Blue and White. It is now widely assumed that, having won 65 of the Knesset’s 120 seats on election day, Netanyahu’s Likud and its right-wing allies will form the next government. Does this mean that Israelis have become blind to his flaws or are somehow fooled by his trademark diversionary tactic of always blaming and attacking his critics for his troubles? Not at all. Rather, the majority of voters identify themselves with Netanyahu’s and Likud’s center-right ideology, weigh his political virtues more heavily than his personal vices, and therefore believe that any threat he might pose to Israel’s ethos and democratic spirit pales relative to the graver, existential dangers from which he protects them and the country. Whether or not one shares this judgment, there are ample reasons to respect the maturity and common sense demonstrated throughout the campaign and on election day by the vast bulk of Israel’s voters.